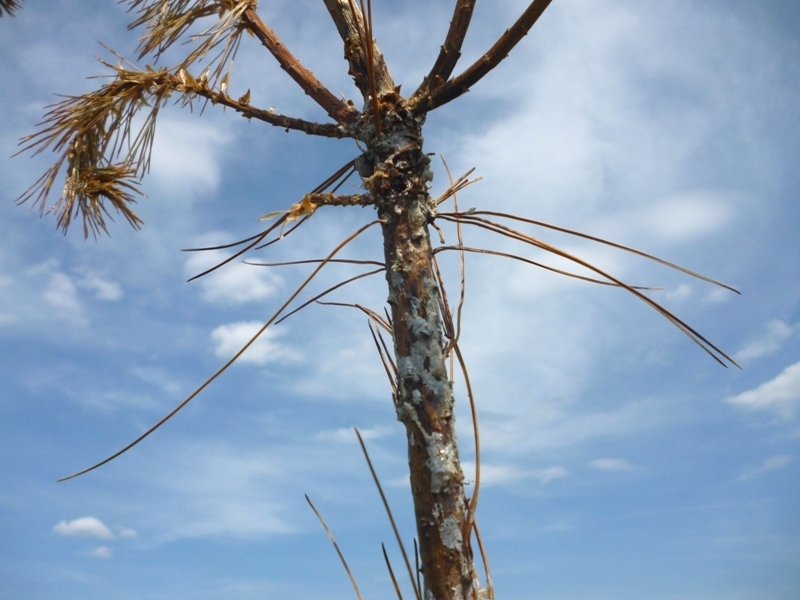 Damage from previously active White Pine Weevil larvae (Pissodes strobi) has been evident for the past several weeks on Eastern white pine, Norway spruce, Siberian spruce, Colorado blue spruce, & Douglas-fir. The larvae began feeding within the terminal leaders last April. When the terminal leader is heavily infested, larvae feed side by side in a ring encircling the stem. 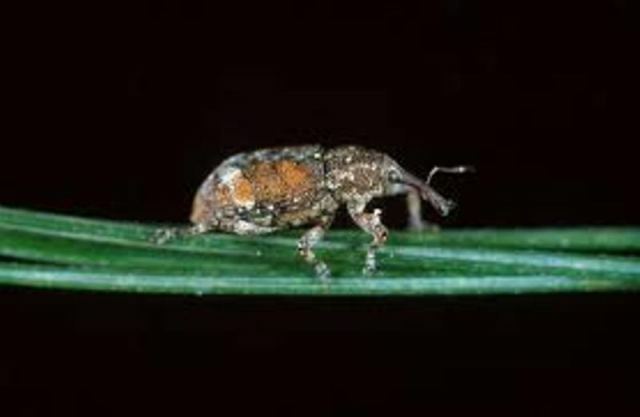 By late spring or early summer, most White Pine Weevil larvae have pupated & emerged as adults. The terminal leader has become stunted and wilted. It is too late in the season to save the leader and it should be pruned out. To re-establish a new leader and retain the desirable Christmas tree shape read further & follow the procedures suggested. Remove the dead or dying portion of the terminal leader. Also, remember that the larvae did feeding damage primarily in the terminal growth that expanded during the 2013 spring growth. Therefore, the leader growth from both last year and this year need to be removed. Then one of the strong side lateral branches from the whorls that grew in 2013 needs to be selected & staked in order to establish it as the new dominant terminal leader. 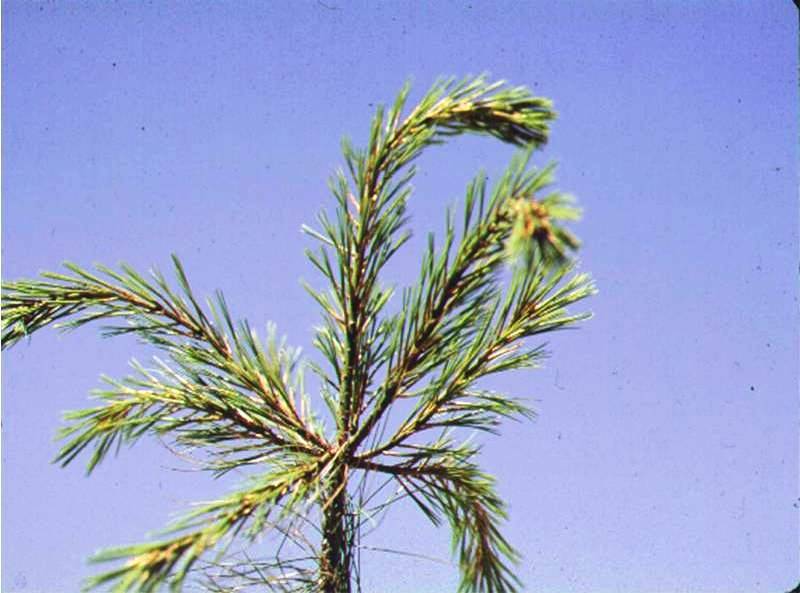 Some nursery & Christmas tree farms have reported good results with selecting a lateral branch that grows on the north side of the tree. This north lateral branch will have the natural tendency to grow upward and reach toward the southern sun. Many arborists & landscapers often find it difficult to prevent this pest, because they are typically applying fertilizer & dormant oil treatments during the control window. The control window against adults (7-58 GDD) occurs in March & April in the state of NJ. Treatment timing is critical with this pest and it is necessary to control the adult female prior to egg lying. 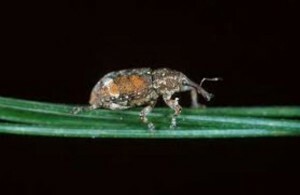 Apply preventative sprays (e.g., pyrethroids) only to the terminal leaders during this time period. Adults over-winter in the duff beneath trees. 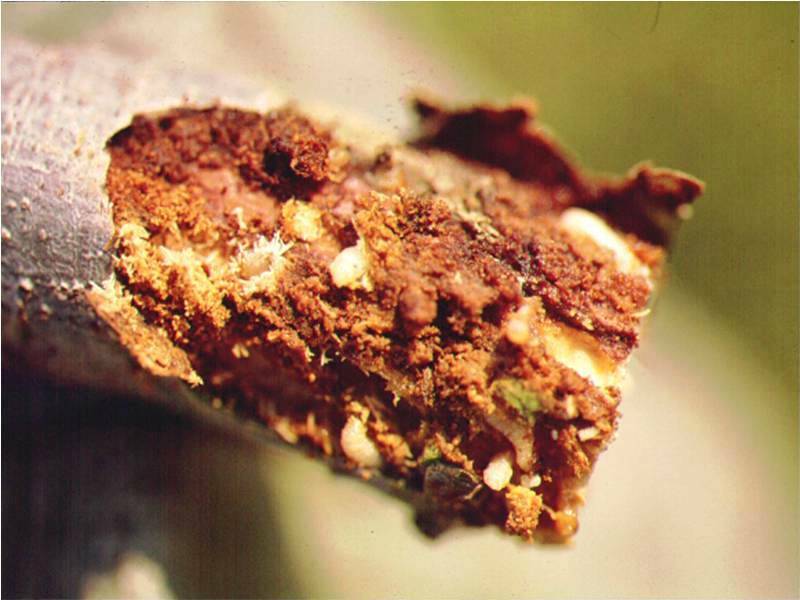 Before egg lying, adults will chew holes near the terminal bud of the central leader & cause a characteristic pitch flow that becomes white in color when dry. Eggs are then laid in the protected holes usually within the top 12 inches of the terminal leader. Prune out infested terminal leaders containing larvae during June, before the next generation of adults begin emerging (only one feeding generation per year). 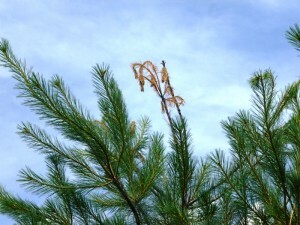 The white pine weevil larvae will cause a “shepherd’s crook” before killing the new main terminal leader & side laterals. The new candle growth is capable of extending during the spring months, but by late spring or early summer the feeding larvae will have destroyed much of the water conducting tissues in the previous year’s leader. 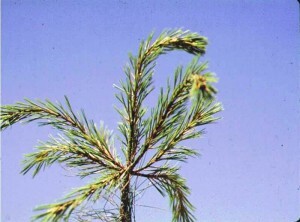 Smaller trees may lose their Christmas tree shape and/or develop multiple leaders. 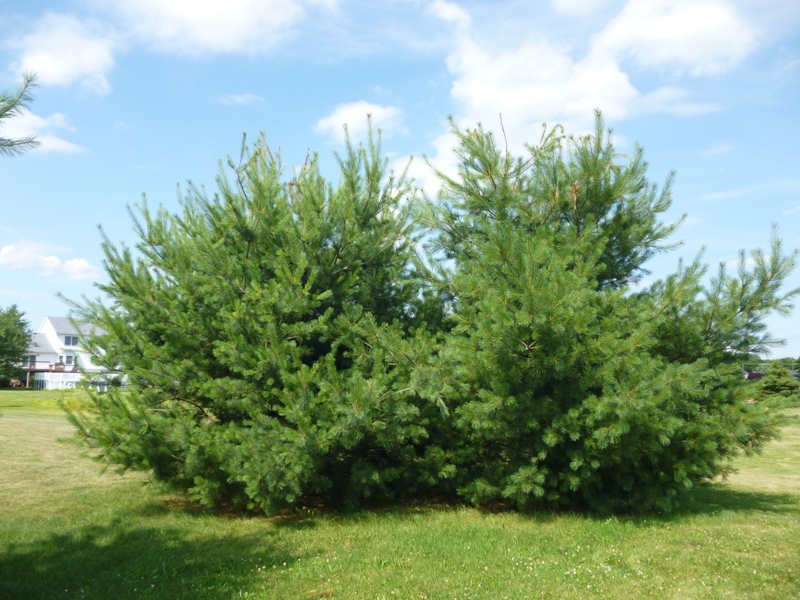 Once white pines reach a height of 20 feet or more, they are more tolerant of this pest because they naturally develop multiple leaders.